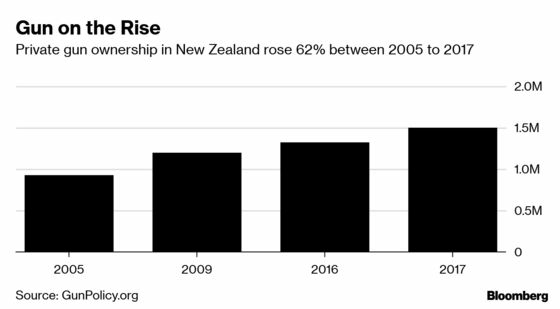 (Bloomberg) -- New Zealand’s gun ownership rate has risen in the past decade to become one of the world’s highest. Yet with homicides well below global norms, the peaceful South Pacific nation has largely escaped the deeply polarizing debates over guns that are common in the U.S. That changed on March 15, when 50 people were killed in a terrorist attack on two mosques in the South Island city of Christchurch -- New Zealand’s worst mass shooting in modern history. Within a week, Prime Minister Jacinda Ardern announced a sweeping overhaul of gun laws in the country of almost 5 million people. 1. What is Ardern planning? New Zealand will ban military style semi-automatics and assault rifles and establish a nationwide buyback of the weapons. The ban will take immediate effect to prevent the stockpiling of weapons while the legislation is being drafted. The buyback could cost the government between NZ$100 million and NZ$200 million ($140 million). Exemptions will be made for shotguns and 0.22 caliber rifles for farmers and hunters. Ardern had indicated her response to the mosque shootings might echo that taken in Australia, which enacted sweeping reforms after a massacre in 1996 left 35 people dead in Port Arthur. 2. What happened in Australia? Conservative Prime Minister John Howard angered the gun lobby then by quickly pushing through legislation that banned certain semi-automatic weapons, tightened registration rules, established a national firearms registry and bought back and destroyed 640,000 civilian-owned guns. The changes have been credited with all but ending mass shootings in the country. 3. How many New Zealanders own guns? New Zealand has the 17th-highest rate of civilian firearm holdings per 100 residents in the world, with 26.3, according to the Small Arms Survey released in Geneva in June. By comparison, the U.S. has 120.5 guns per 100 residents, the highest rate globally. The total number of guns, both legal and illicit, held by New Zealand’s civilians reached 1.5 million in 2017, according to GunPolicy.org, a firearm prevention group hosted by the Sydney School of Public Health. That’s an increase of 62 percent from 2005 (compared with a population jump of 18 percent). Rifles and shotguns, which are bigger and typically require two hands to operate, are the firearms of choice. That’s likely indicative of their use for hunting or by farmers protecting livestock. 4. How many murders involve guns? Relatively few. In the decade up to 2015, there were only two years in which the number of gun homicides reached 10 or more in New Zealand. The overall homicide rate of 1.2 per 100,000 people is well below the global rate of 6.4, according to a WHO report from 2015. 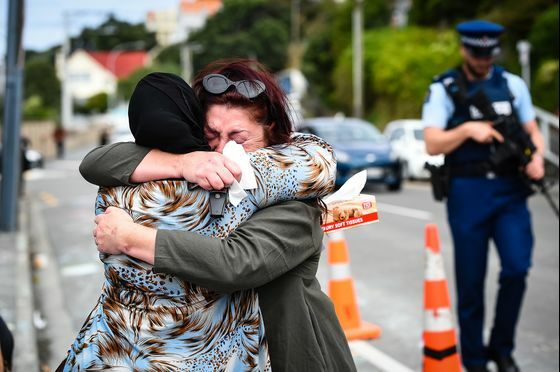 Before the Christchurch attacks, the worst mass shooting was the Aramoana massacre in 1990, when a gunman killed 13 people near the city of Dunedin after an argument with his neighbor before he was fatally shot by police. That massacre sparked lengthy debate about gun control in New Zealand and led to changes in gun laws, including restrictions on military-style semi-automatic weapons. 5. What were the gun ownership rules in New Zealand? Prior to Ardern’s overhaul, ownership was already strictly regulated compared with the U.S., but police and lawmakers have been raising concerns over the past few years. Firearms licenses are only awarded after interviews and background checks. Residents must show up at their police arms office, typically at the police station, to apply in person. Even with a license, a special endorsement is needed for military-style semi-automatic rifles or shotguns. Regular license holders can use shotguns and rifles that require no special endorsement as well as certain airguns. Gun licenses can be obtained starting at 16 years of age. Permits are needed to buy pistols from individuals and the licenses of gun dealers must be renewed annually, according to national laws. The Christchurch terrorist had a category-A license so was legally entitled to own the two semi-automatic weapons, two shotguns and lever-action firearm that police recovered. 6. What were the concerns? Police have been warning of loopholes for some time. In a 2017 briefing to the country’s police minister, a senior police officer said the regulatory framework was outdated and gun laws had not “kept pace with changes in the marketplace, technology and accessibility to high-risk firearms.’’ There was a specific warning about the ability for holders of a basic category-A gun license to buy a semi-automatic and easily convert it to a military-style weapon by inserting an unregulated high-capacity magazine. This allows someone to circumvent the more tightly controlled category-E license that’s required for military-style semi-automatics. Also, a parliamentary inquiry released in April 2017 to the previous government urged tighter gun registrations, more controls on gun dealers and owners, and the creation of a new category of restricted semi-automatic weapons. Most of the recommendations were rejected. Gun ownership rates globally: Small Arms Survey. A QuickTake on guns in America.